In medium bowl, combine all salsa ingredients; mix well. Cover; let stand at room temperature to blend flavors. In another medium bowl, combine milk and eggs; beat well. Lightly spoon flour into measuring cup; level off. Add flour, cornmeal, 2 tablespoons sugar, baking powder, salt and ground red pepper to milk mixture; stir just until dry ingredients are moistened and large lumps disappear. Stir in corn. Heat nonstick griddle or large skillet to medium-high heat (375°F.). Lightly grease heated griddle. For each corn cake, pour about 1/4 cup batter onto hot griddle, spreading batter to 4-inch diameter. Cook 2 to 3 minutes, turning when edges look cooked and bubbles begin to break on surface. Continue to cook about 2 minutes or until golden brown. Repeat to make 12 corn cakes. Serve with salsa. For an easy substitution, canned mandarin orange segments, drained and chopped, can be substituted for the fresh orange. 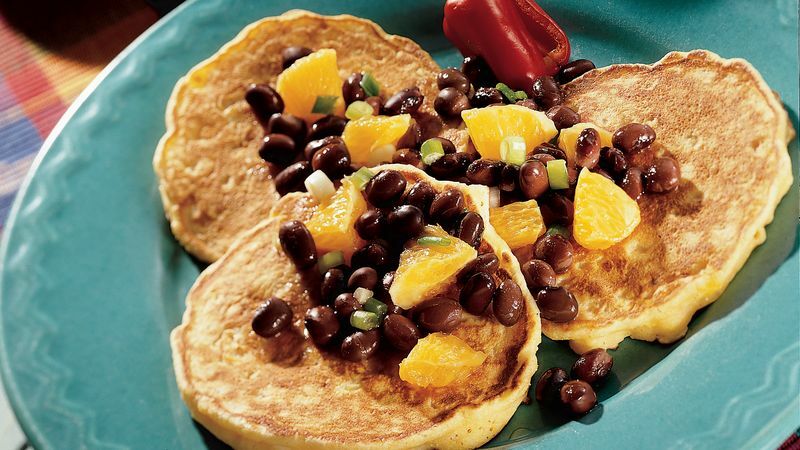 This recipe combines the complementary plant proteins from corn and from black beans to provide a complete protein dish. Garnish the corn cakes with dollops of sour cream, and serve wedges of honeydew alongside.